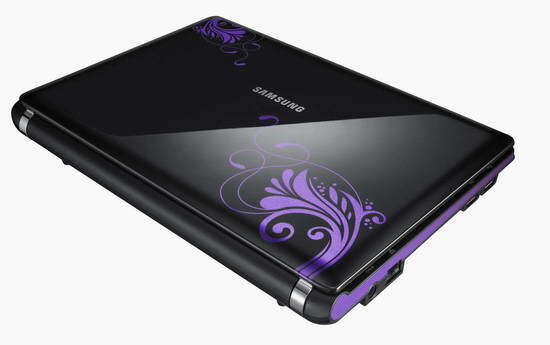 Samsung company has recently released mini laptop – NC10 La Fleur. As with other gadgets from the line, this novelty is designed for women. Design encompasses miniature size and distinctive ornament in glossy black and white body. Samsung NC10 is powered by Intel Atom Processor with Windows XP Home operating system and features 10.2 inch display with 1024х600 resolution, up to 160GB HDD, WiFi, Bluetooth, 10/100 Ethernet LAN and three USB ports. It also features 6 cell battery with 8 hours of autonomous work. The laptop weighs no more than 3 pounds. 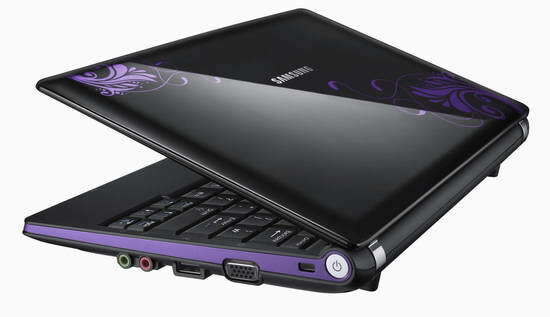 Samsung says their new laptop would be great choice for women who see gadgets as part of image. It makes sense to add that the body of Samsung NC10 La Fleur is made using Samsung’s Duracase technology, which protects it from scratches. The keyboard also has the special antibacterial coating. Olá. Gostaria de saber o preço desse laptop, pois estou querendo comprar um.